How does the workforce get experience while in school? Traditional internships can work, but those programs are often loosely managed and disorganized, netting less than favorable results. Internships are also very limited in scope and scale, so only a small number of student to company placements result. Students are often challenged to get out in the job market as fast as they can, because they need the experience. However, this translates to less than ideal skills to hire. 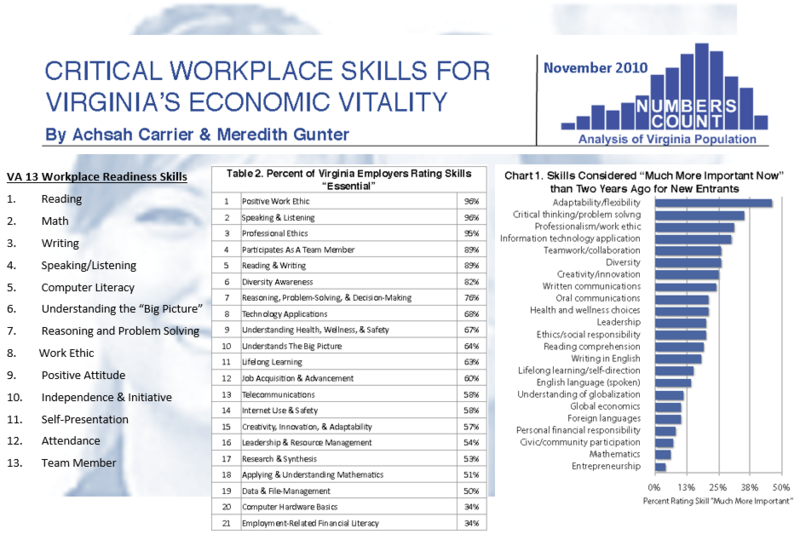 Companies in Hampton Roads need to be able to leverage workforce both out of school as well as exiting military so that their growth can remain in Hampton Roads. Students need to come to companies with state-of-the art knowledge AND experience in its applications. HRIC assists in coordinating activity for the Hampton Roads Innovation Collaborative. In early 2017, we surveyed area CIOs to learn about what their current requirements were for job candidates. There’s a crisis in the Hampton Roads economy that has nothing to do with the availability of jobs. In fact, the region could welcome a dozen new Fortune 500 companies with open arms and empty skyscrapers … but it wouldn’t matter. Click the link below to read the full article from Inside Business and a new effort from WHRO. This presentation was prepared by Dan Bell, former Business Services Committee lead for Opportunity Inc.
Click link below for full presentation.